Where can I download complete MMD projects? I am looking for an animation project resource with models, motions and music WAV files. Where can I find MMD model download links? is an MMD Animation Project Resource! Do you want to find links to new models… new stages… motion and music files? … YouTube’s Ushimitsu Toki is the place for you! 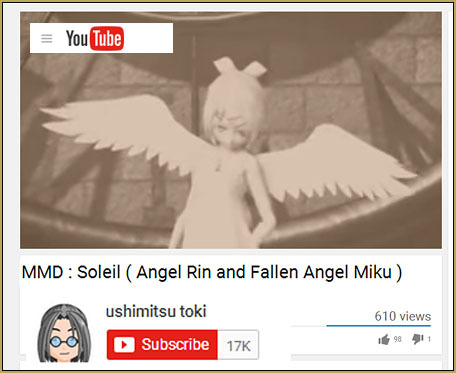 I have been clicking-around on the videos on that YouTube channel and I see that Ushimitsu Toki is amazingly prolific… posting a video at the rate of one or two a week!… maybe more!… and every one of them includes full credits for all of the elements in the video… along with links to their sources… awesome! Ushimitsu Toki’s animations are modern and complex and feature a wide variety of models and many MME effects… fun to study them! You can see that, as of this writing, she has 17,000 subscribers… and that video, in the picture, was posted for less than twenty-four hours and already has over 600 views! 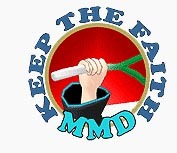 Looking for an MMD animation project resource? – Visit Ushimitsu Toki’s YouTube videos. Hi! I am wanting to make a Bendy and the Ink Machine animation but I am not allowed onto DeviantArt for personal reasons. Is there anyway someone can email me the model code thingy please?